Lumics is resetting the benchmark for the most innovative NIR diode laser portfolio! The product range comprises multi & single mode diode lasers from 670nm to 1940nm. The LuOcean series offers the widest choice of wavelengths, sensors, accessories with fiber coupled output powers from 1W up to >1kW. Proprietary driver and heat management solutions complement the offering. Class leading single & multi mode high power laser diodes and fiber coupled modules plus matching OEM driver boards and heat management solutions. 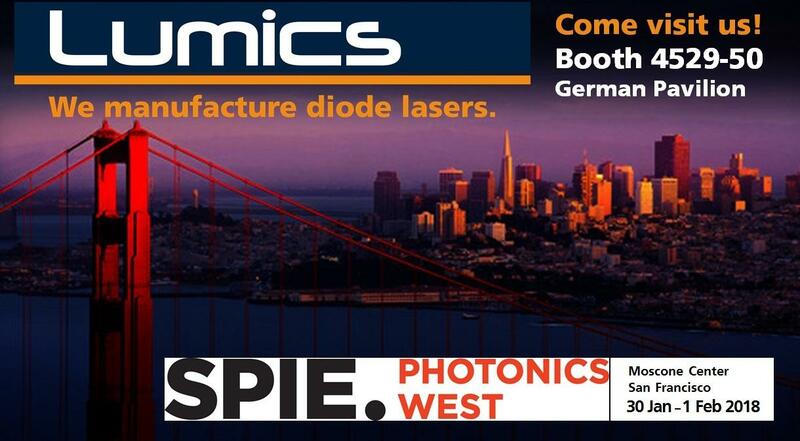 Come stop by our booth A3.305 at LASER World of Photonics in Munich and discover our outstanding lasers for your outstanding developments! We look forward to seeing you! We are excited to inform you that Lumics has moved to new enlarged facilities! The new premises are still in Berlin so we keep staying in this fascinating city. Our new group-owned headquarter gives us much more space for development, chip and module production, and sales distribution of our high-power fiber-coupled diode laser modules. 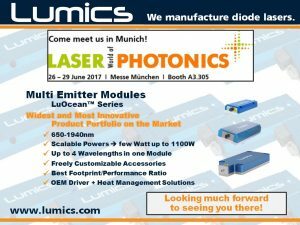 Lumics GmbH, Berlin, makes again a significant step towards providing complete state-of-the-art solutions by developing a proprietary diode laser driving board which is highly optimized for the Lumics LuOcean™ „Mini“ series and thus considerably simplifies design and production on customers’ site. Particulary for its many customers with medical and industrial applications, Lumics can now offer a very price attractive and particularly user friendly turn-key solution, both for operations in continuous and pulsed mode. This brand-new driver board uses cooling by free convection only, and offers full digital access to all functions of the laser module, for example switching on/off a pilot laser beam.